Devi Kali is revered by Hindus as the incarnation of Shakti, the original female source of life. Bengalis and Gujaratis in particular have a long celebration of Devi Kali during Navratras (nine days) that ends with the submersion of the Devi's idols on the 10th day. 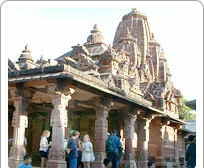 Osian has a beautiful temple dating back to the 8th century dedicated to Devi Kali.